It's an honor to ride for these kids to raise awareness and funding for effective treatment options needed right now. The Kids’ Cancer Research Foundation’s (KCRF’s) Executive Director, Frank Kalman, will ride his BMW motorcycle from San Luis Obispo to Chicago to attend a top gathering for cancer researchers in the U.S. The trip will include 5,000 miles in the July heat to raise awareness for the need to more adequately fund research into cures for kids’ cancers, especially neuroblastoma, the focal point for KCRF and the conference, the Neuroblastoma Parent Education and Medical Conference. Imagine having a doctor tell you your 12-year-old daughter has cancer. Then nine months later have same doctor tell you “she’s not going to make it.” After hearing these words 15 years ago, one father and mother made a pact that there would be no limit to what they would do and where they would go to save their child’s life. After a brutal 15-year journey, their daughter finished college and was married. While she may never be out of the woods she is one of the lucky ones. All the other kids that they had come to know early on in her journey are all gone now. The loss of that last child triggered the formation of the Kids’ Cancer Research Foundation to stop the suffering and loss caused by this childhood cancer. Never take anyone’s word when your life is at stake – always confirm what you’re told. There are times when we have to “pull out the stops” to find a way through. These principles guide the Kids’ Cancer Research Foundation’s mission. The foundation has assembled a medical advisory board second to none to guide decisions made about funding research and how best to coach patients and their families through our complex medial system. When a child anywhere in the country is diagnosed with neuroblastoma, the deadliest form of childhood cancer, that child will be given treatments developed by doctors on the KCRF medical advisory board. 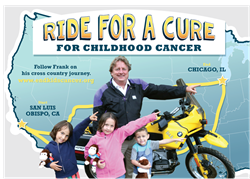 Called “Ride For A Cure,” Frank will ride from San Luis Obispo, California starting on July 11th to arrive in Chicago on the 14th to attend the conference, one of many he attends each year.